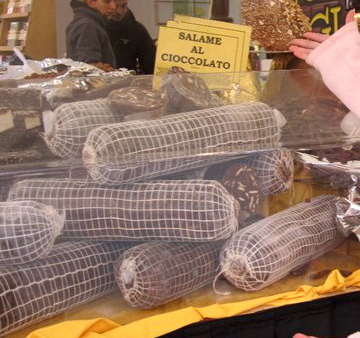 No that is not a typo; the title does say chocolate salami. Wait, what? As in, chocolate meat? No, silly, as in a chocolate dessert that resembles one of our favorite school lunch meats. My first introduction to the sweet came during lunchtime while spending last spring semester abroad in Florence, Italy. When it came time for the dessert course, everyone in my program lined up to see what was to be enjoyed with our cups of espresso. Hopeful for a buttery tart with Nutella or a caffeinated layers of tiramisu, we were confused by the sight of a treat that resembled processed meat. Although the name and the look of it made some people put their plates down and continue on to the coffee carafe, I took a piece of the “salami” and dolloped it with spoonfuls of whipped cream. Though it looked like one of Italy’s favorite products from the macelleria (butcher), it tasted like a great chocolate truffle studded with crushed biscotti cookies. Softer than a brownie, the salami combined chewiness and crunchiness in one chocolatey bite. Considering how scrumptious the chocolate “processed meat” tasted, I was excited to learn that it was a very simple thing to make. No baking required and just a few basic pantry items on the ingredient list: chocolate salami can be created with very little effort. The only thing requiring effort would be waiting because though it takes less than five minutes to prepare, the salami must harden in the refrigerator for at least three hours before serving (chilling the chocolate log ensures that it stays its shape when sliced). But once the time has passed, you can reward yourself for your patience by cutting up a few slices of salami and enjoying one of Italy’s simplest desserts. Separate the egg. Set egg yolk aside, and beat egg white until slightly stiff. Combine melted butter with sugar, cocoa powder, and crushed biscotti. Stir egg yolk into cookie mixture, then fold in the egg white. If too thick to stir, add a little water or chocolate liquor to loosen slightly. Place mixture on plastic wrap and shape into a compact log. The consistency should be like a thick paste. Roll in plastic wrap and place in fridge for at least three hours or in the freezer for one hour to harden. When ready to serve, slice the log into thick circles and serve with a fresh dollop of whipped cream and hot espresso or coffee. De mon cot� c’est un peu diff�rent mais on retrouve en bref les m�mes partie. Vraiment cool comme projet. Chef Tiramisu.